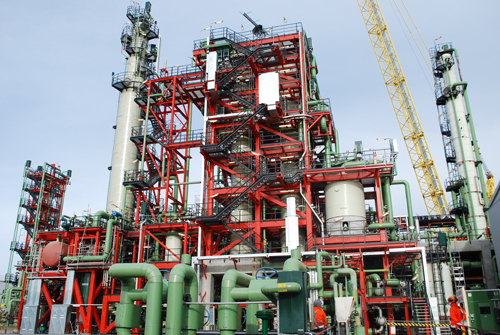 A new isomerization unit has been completed at Neste's Porvoo refinery. It converts naphtha into a product of a higher quality and value. The unit is an EUR 80 million investment that will open up growth opportunities for Neste and its customers. Every year, Neste makes tremendous investments in developing its operations, especially in the company's refineries. The total value of the investments will amount to roughly EUR 500 million this year. One of the projects is a gasoline isomerization unit. It was completed at Neste's Porvoo refinery in the summer. "Neste has been specializing in pure and high-quality products for a long time. This investment is well in line with our strategy," says Matti Lehmus, Executive Vice President, Oil Products at Neste. According to Lehmus, the isomerization unit upgrades naphtha. It is a gasoline fraction of inferior quality produced in refining oil. Naphtha has a low octane number. In addition, its steam pressure is relatively high, meaning that the product is highly volatile. Naphtha is used as a feedstock in the chemical industry and as a blending component in gasoline, among other uses. "The isomerization unit converts naphtha into a higher-quality gasoline component with properties far superior to the original. Its octane number is high and steam pressure is lower," Lehmus says. "There is often a shortage of the high-octane gasoline components produced by the isomerization unit in the summer," says Neste's energy expert, Senior Advisor Lauri Kärnä. Kärnä says that demand for gasoline has been higher than predicted in the West this year. "The decrease in the price of crude oil and gasoline has increased demand and also refining margins," Kärnä says. Even though there is overcapacity in gasoline production in Europe, there is a shortage of high-octane gasoline fractions in the market due to several reasons. According to Kärnä, one of them is an increase in the production of shale oil in North America. With the share of shale oil increasing in the market, the amount of gasoline components that increase the octane number has decreased. "The timing of the startup of the unit was excellent," Matti Lehmus says. "There is a clear need for the product in the market. In fact, the value difference between inferior and superior-quality gasoline fractions has increased from what we estimated four years ago." The Porvoo refinery's annual overall gasoline production capacity will increase by approximately 200,000 tons. With the increasing availability of high-quality gasoline fractions, production can more freely decide which kinds of products are made at the refinery. "We can produce high-quality gasoline grades more flexibly than before," Lehmus says. The high-octane gasoline fraction thereby also increases the flexibility of production. The component is also sold to Neste's customers, who can improve the quality of their own products. The construction of the isomerization unit took over four years, and its cost was approximately EUR 80 million. Lehmus is satisfied with the outcome. "The project was very demanding, as the unit was built next to an operational plant in a confined space." The project almost adhered to its schedule and budget. He is also satisfied with the implementation of occupational safety. Neste will continue its major investments in improving quality and competitiveness. The next projects include the new solvent deasphalting unit (SDA) in Porvoo, an investment of approximately EUR 200 million. The investment in modifying the configuration of the Naantali refinery will amount to EUR 60 million. It will result in an efficient integrated refinery. In addition, a project with a value of hundreds of millions of euros to modernize the power plant of the Porvoo refinery area is being planned. The aim is to realize this project in cooperation with partners.